A nonnative species, the cane toad (Bufo marinus), has been creating destruction to the environment of northeastern Australia. Was are the effects of a new species coming into an ecosystem? How can the effects be reversed? Figure 1. Cane Toad (Bufo marinus). Photograph by Alex Popovkin, 2010, FlickrCommons. CC BY 2.0. Figure 2. The Cane toad (Bufo marinus) has spread rapidly in the north eastern portion of Australia from 1940 to 1980, and still continues. Courtesy of Froggydarb, 2006, Wikimedia Commons. CC-BY-SA. 3.0. Figure 3. Northern Quolls (Dasyurus hallucatus). The Northern Quoll has seen a decline in their populations in Australia due to the poisonous Cane toad. The second image shows a map of the Northern Quoll distribution in the country. Courtesy of John Gould, 1863, Wikimedia Commons. Public Domain., and IUCN Red List of Threatened Species, 2010, Wikimedia Commons. CC BY-SA 3.0. Although there have been many efforts and people involved, it seems nearly impossible to eradicate the toads from Australia.10 Efforts by scientists to remove eggs from ponds and kill as many cane toads as possible have been ineffective.10 A biological control that is being researched to combat cane toad populations is parasitic lungworms, but this method is not yet ready for implementation.10 Another study discovered that cane toad tadpoles like to eat cane toad eggs, because the eggs expel a toxin that attracts the tadpoles.10 Other scientists think the only hope to completely eradicate the toads would be the use of a biological control, however, this is the method that originally brought the species to Australia.3 If not stopped or controlled, the population of cane toads will have an enormous and detrimental effect on the entire Australian ecosystem. Figure 4. Distribution of Bufo marinus, as of 2006, with the native range shown in red. The cane toad is an invasive species that has spread rapidly to the country of Australia and continues to spread, due to lack of predators. 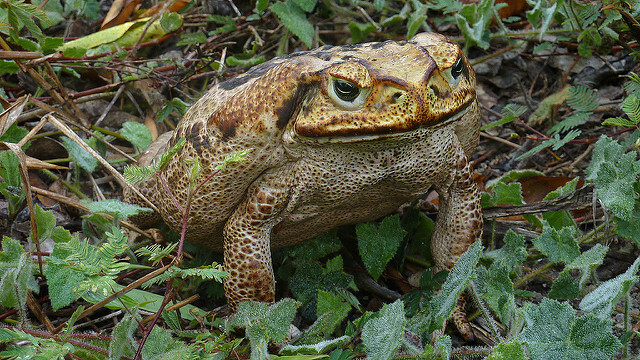 The cane toad continues to cause harm to the native species of the country. Modified from LiquidGhoul, 2006, Wikimedia Commons. CC BY-SA 3.0. Brown, G.P., et al, (2007). Invasion, stress, and spinal arthritis in cane toads. Proceedings of the National Academy of Sciences of the United States of America (PNAS), 104(45):17698-17700. Phillips, B. et al. (2006). Invasion and the evolution of speed in toads. Nature, 439:803. Zielinski, S. (2012). The reluctant toad killer. Science, 336(6087):1375-1377. Froggydarb. (2006). [Interactive graphic of the spread of the Cane Toad throughout Australia from 1939 to 1980 at five year intervals]. Retrieved from Wikimedia Commons. CC BY-SA 3.0. Gould, John. (1863). [Illustration of Northern Quoll]. Modified from Wikimedia Commons. Public Domain. IUCN Red List of Threatened Species. (2010). [Map of the Northern Quoll range]. Retrieved from Wikimedia Commons. CC BY-SA 3.0. LiquidGhoul. (2006). [Map of Cane Toad Native and Introduced Ranges]. Modified from Wikimedia Commons. CC BY-SA 3.0. Popovkin, Alex. (2010). [Photograph of Cane Toad]. Retrieved from FlickrCommons. CC BY 2.0. Previous: 1.1 Goats as Control for Non-Native Invasive Plants: a Win-Win?